South Africa’s newest caravan manufacturers, Okto Caravans, have revealed their first prototype. I attended the official launch of the Villa model at Loftus Caravan City in Randburg, Gauteng, as the representative of Caravan & Outdoor Life. As soon as I arrived at the dealership, the excitement that had been building since the morning when I boarded a flight from Cape Town (and for months before, since the Okto team informed us of their plans to build a new caravan), grew even more. The dealership was decked out in the bold colours of Okto – big red and white banners , tables with red cloths, and the unmissable caravan in the front… hidden away under a bigger red cloth! Of course, there was also a red carpet leading up to the unit. After a quick welcome from Woody Loftus, the guests and media were given a message from Keith Laing, one of the men at the head of Okto. Keith, who resides in Australia these days, could not attend the launch, but addressed the crowd by means of a pre-recorded video. Tinus said, “I left the caravan industry four years ago after being involved for nearly 20 years. After a year away, I bought a caravan for my family to go [on holiday]. Sitting around the campfire, we would talk, as all caravanners do, about our toys and what we like about them and what we would change. “I came to realise that I missed the process of building something. Of taking an idea, a concept, and turning it into something that some people would like, and others would not, and then doing it all over again. “A year ago, the opportunity arose for me to again become involved in an industry that I have loved all my working life. Tinus van Wyk wanted to set up a company, and needed a partner that would contribute to something new and exciting. “In joining Tinus, I knew I had a partner who was hardworking, diligent and clear-thinking. I know that he is the best person to set up a caravan factory and get it flowing. “We hired a designer, Ingo Ferreira. We knew that Ingo was uniquely positioned to do the design work, given his many years of experience doing just that. “We brought Loftus Caravan City on as dealers. The Loftus brothers were concerned about the state of play, and were keen not to have all their eggs in one basket. We consulted with them to ensure that we developed a product that was in line with what the current market is looking for. “We wanted something that is unique; something that is different. We wanted it to be light. We wanted to partner with suppliers of caravan equipment from around the world that would bring their expertise to the party. “We wanted to deal with some of the challenges that have plagued the caravan industry. We wanted the caravan to fit into a garage, so that townhouse owners could store it there and not get into trouble with the body corporate. “We wanted it to be simple and elegant. We wanted it to be Wow! “In the last year we have designed a caravan, put a factory together, cut the moulds, and built machinery to glue the vacuum press components. We have contacted companies all over the world to bring you a new, and I think an exciting, addition to the South African caravan market. The first thing you notice about the Villa is the big pop-up roof. The caravan actually measures only 2 062 mm in height with the roof closed. But, pop the top, and you add 500 mm of headroom. The entrance to the Villa is behind the wheels. To the right of the entrance, right at the back, is the window of the dinette. Left of the entrance is a large fold-down hatch that creates a work surface. This is held in place by two poles that clip onto the caravan body on either side of the wheel. The hatch contains eight shelves, on which you can store crockery, cutlery, groceries, etc. The right side of this storage space is also accessible from the inside. Above the hatch is an LED light. To the left of the hatch (towards the front) is a big window, which is on the bedroom. Right at the front on the left side (passenger side) is another small hatch, behind which you will find a slide-out kitchen unit. The kitchen contains a glass-top two-plate gas burner stove, and a basin with running water. There is also another small work surface, with a drawer below it. Moving to the front of the Villa, you will find a big nose hatch that’s almost the width of the caravan. Although the water and gas bottles are housed here, there is still more storage space. The back window of the caravan, at the dinette, is massive. Okto designed their own windows for front and rear – all of which are double-glazed for insulation. The spare wheel is integrated into the chassis underneath and is easily accessible by means of its slide-out mechanism. Includes full tent, gas bottle, charger, battery, crockery, cutlery, microwave, and fridge/freezer. One of the main focuses of the Okto team was, as Keith said, to deal with some of the challenges that have plagued the industry for years – the two main concerns being wood-rot and weight. To deal with the first concern, Okto caravans are entirely timberless; and to keep the weight down, various manufacturing techniques have been implemented, including the use of a unique chassis and an aluminium body frame. Okto builds their caravans on a German-manufacturer AL-KO chassis, opting for the Australian-specced version that has been beefed up even more for local conditions. The main beams are punched from 2mm mild steel and are made in one piece from front to back. Components are all hot-dip galvanised to prevent any rust. The axle system is also designed and manufactured by AL-KO, and comes with an overrun braking system and independent suspension. The 40 mm-thick floor is reinforced with aluminium beams, and all materials are bonded together inside a vacuum press to create a composite panel that is extremely strong, and is then finished with hard-wearing cushioned vinyl. One of the most exciting elements of Okto caravans is the unique body construction – the walls are made with an aluminium skin on the outside, with a GRP (fibreglass) and polystyrene core. Both skins are single sheets with no joints. The wall is framed with aluminium beams, and all the materials are glued together in a vacuum press to create a single composite panel. Entrance to the Villa is on a solid step built into the body. Stepping in (from the left side), you find the dinette on your right, in the back of the caravan. The dinette consists of a bunk seat on either side of the caravan, with a table in the middle. The table (which had not been completed in the prototype we saw) will be on a gas strut, allowing it to be lowered to create sleeping space for two people. There is packing space underneath the seats. The kitchen is fitted with a 43 L microwave and a 192 L Defy fridge/freezer. The 12 V system ensures that the fridge can continue working even when the caravan is not plugged in. To the left of the fridge there is a microwave and “coffee station”, as well as a basin with running water (and a glass cover). The inside kitchen has two cupboards above the microwave, and below it is a drawer and three big cupboards. Opposite the kitchen, on the left side of the caravan, is your main packing space for clothes and other items. This three-door cupboard which has loads of little shelves inside makes it a total of 15 storage compartments. On the side of the cupboard (right by the door) is the electronic switch panel, from where you can control all your lighting and monitor your power. All lights are LED. In the front of the caravan is the sleeping area, which consists of a double island bed in the middle. On the right side of the bed is a single long cupboard, which is where you will hang clothes. The left side has a small drawer next to the bed, on which you can place your coffee or book or phone when lying in bed. Couples will have to decide who gets the convenience of being able to put down their drink when going to bed! The left side of the caravan, at the bottom end of the bed, has a few more drawers, as well as a dedicated space in which a porta potti can be placed. There is more packing space in horizontal cupboards above the bed, and a reading light is fixed on the left and the right. All the locks and fittings are Italian, which gives a high quality finish. Door fittings are push-to-open. The furniture is made from lightweight plywood cut by computer-controlled routers, and covered with a foil. The Villa caravan launched at Loftus Caravan City was the very first prototype. It had rolled off the factory floor literally just hours before the event. The team have made it very clear that it was not 100% done, and that they have taken note of comments, concerns and suggestions regarding the build. I spoke to the Okto team a few weeks after the launch to check on the developments. Woody Loftus informed me that they had made good progress in implementing upgrades, changes and adjustments, and that a new prototype was expected to be ready by the end of July. Some of the first tweaks on the Villa include increasing the size of the outside slide-out kitchen, adjustments to the roof, and improvements to the tent. Even the external colour is changing slightly. 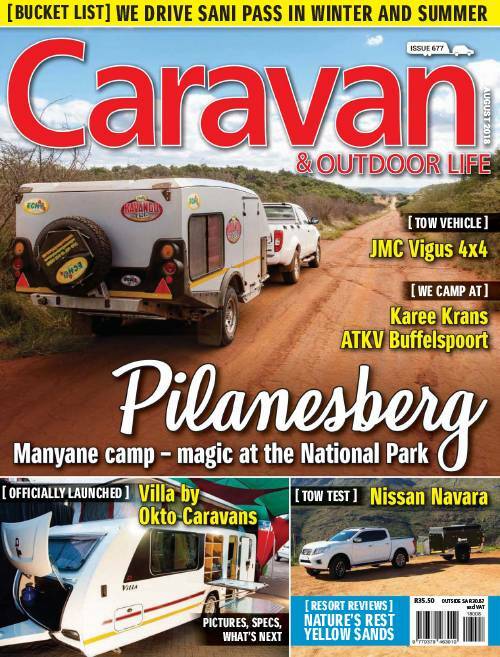 Make sure that you get your September edition of Caravan & Outdoor Life for details and images of all the upgrades.